Step-by-step progression of how I created my “Have A Nice Day” skate deck, part 1. I hadn’t done an art project in so long that when our Web Creative team suggested we hold a 2-Tone Skate Deck Challenge, I jumped at the opportunity. Had tons of fun doing it, but definitely felt out of practice. Here’s a quick writeup of how I did it. Step 1: Started with a deck donated by our friends at Arnette. It already had a design on it, so the instructions were to either paint over it, or sand it off to have a clean canvas to start. Step 2: I was too lazy to sand the board smoothly so I decided to use the original design in the background to some extent for additional textural elements. I scratched up the surface with rough sandpaper to give it that “used” look. Step 3: Sprayed a little chrome paint in a few key strategic areas to give the base some shine. The pictures don’t really do it justice, but I really liked the way the deck looked at this point. The chrome on black scratched up paint was really cool. I wish more of this look could have been preserved in the end result. Step 4: Used painters tape to mask off the “rising sun” pattern in the background, then spray-painted a soft black border to draw more attention to the center of the design. In the end, this border kind of disappeared with all the other layers of paint I put on. 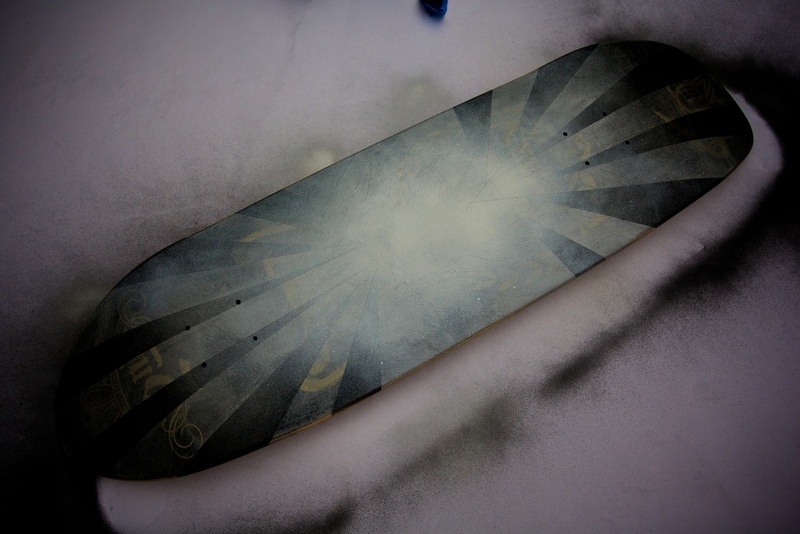 Step 5: After spraying the black border, I filled-in the “rising sun” pattern. The design started to look a little too harsh at this point, but I knew I was going to add some additional layers so I didn’t freak out too much. Step 6: Came back with another layer of spray paint to soften the edges, kick back the background design, and add some texture for modeling. Used both white and chrome in this step for some slight splatter effects. Posterous seems to be a little buggy when it comes to posts that have lots of different images in different sets, so I broke it up into 2 parts.